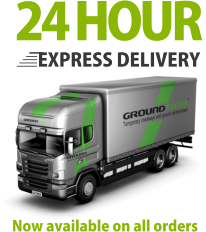 We deliver throughout the UK and Ireland on a daily basis. Extensive stocks are held at our yard in Harrogate for immediate dispatch and we also send directly from our manufacturing partners. Small man-handleable orders are sent with APC. 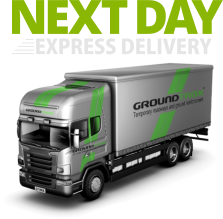 Orders need to be booked in by 13:00 for a next working day delivery. All palletised products are sent via the Palletline network on curtain-sided vehicles, normally on a next working day service. Orders need to be booked in by 12:30 for this service. Please talk to us to confirm availability for your specific site address. 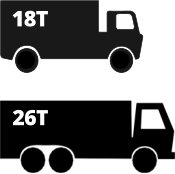 Delivery to site will normally be an 18 or 26 tonne GVW vehicle but may also be on a 44 tonne artic. Please let us know if there are any restrictions at your site address. PLEASE NOTE: Some products may take longer to delivery directly from our manufacturing partners. For certain postcodes, it is not possible to offer a next working day service and extra charges may apply for some areas. For palletised deliveries, we can specify a tail-lift off-load for up to six single pallets (not possible for trackway mats as they won’t fit through the rear doors). For amounts over this, you or your customer will need to off-load with a suitable pallet fork equipped machine. This will include a fork-lift or telehandler. Excavators are not suitable as there is not normally enough headroom to lift pallets from the curtain-sided vehicle with slings etc. All deliveries will require signing for in person. Should our driver not be able to make contact when on-site, the delivery may fail and any further attempts may be chargeable. We’re trusted by our clients because we deliver on our promises. We offer exceptionally competitive prices whilst maintaining a high quality of service from start to finish. Get in touch with us today to find out more.